Come and join us for another installment of the WDW-Memories podcast, where I try to make it possible for you relive your Walt Disney World Memories when you can't actually be there. Today we'll begin a new day in a new park for the new year. Come join me as my family and I begin a new day in a new park. We'll start off in the parking lot and make our way into the park, stopping to see some of the amazing animals and begin heading for our first stop of the day. Well it's time to start a new day in the parks. Last time we left Disney's Hollywood Studios and headed for my shuttle at the Magic Kingdom and returned to the Hotel. Now it's time to start a new day. This time, we're going to start the last park that we haven't done yet, Disney's Animal Kingdom. So let's start some new memories shall we. Let's set the scene. It's a cool morning at the end of January of 2015. This is the end of a weeklong trip to Walt Disney World with my extended family. We're all pretty tired, and are moving a little slower this morning. My family and I couldn't wait to get started though, so we packed all of our luggage into our car and headed out to get to the parks as close to opening as we could. The rest of the family will join us as soon as they can, which will be a couple of hours from now. We'll join the memory on this lovely morning as we pay for parking and enter the parking lot. We'll get directed to a spot near the front of the lot and climb out of our packed rental minivan. Unfortunately, we missed the tram but it's not a long walk from here, so just keep right on going to the front entrance. 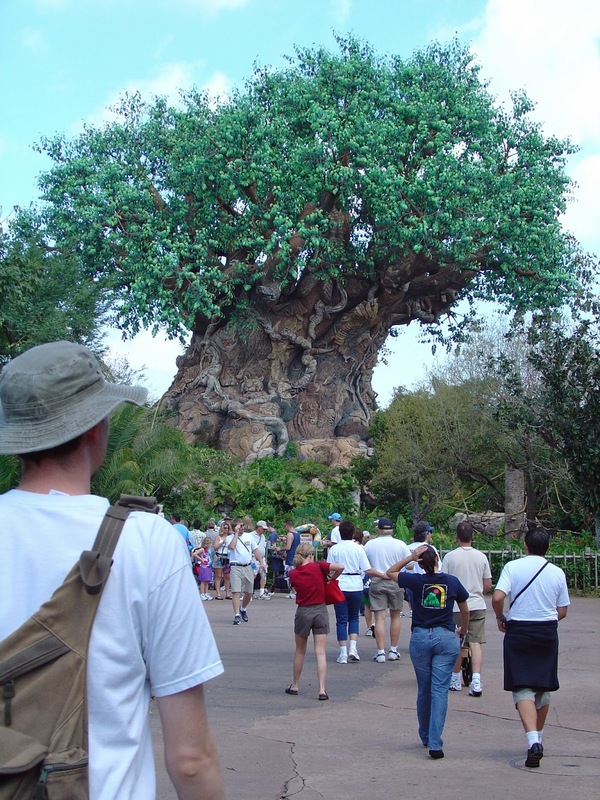 With passes in hand, we'll enter through the front gate and into park and begin to make our way through the twists and turns of the front exhibits, stopping along the way to look at animals and talk with handlers, letting our inner child explore a bit instead of racing to an attraction. Eventually we emerge, and there's the Tree of Life rising up in front of us, drawing us further into our adventures for the day. I love how this park is like Adventureland, there are no strait lines, and every turn feels like an adventure. The green foliage and calming music, and running water, all put you in a state of peace and rest if you'll take time to let it. This is definitely not a park designed to run from attraction to attraction, but is filled with distractions between point A and point B, and you should expect that as you plan your day. If you don’t let the park distract you, yes it's a half-day park, but you will miss out on the intention of this park. So interesting note, I recorded from the time we left our condo, drove on the toll pike, parked in the Animal Kingdom, and entered through the gate, and the total time was under 30 minutes, door-to-gate. So for those thinking that "I have to stay on Disney Property in order to get there as quickly as possible", I spent more time on Disney transportation going from Port Orleans to the Magic Kingdom than I did this morning. And don't get me started on the trip home. Now sit back. Relax. Close your eyes. And come with me as we start a new day in one of my favorite parks.